Richard Henry Sparks, 72, of Mason City died Thursday (May 6, 2004) at noon at his home. His funeral will be at 11 a.m. Saturday at Hurley Funeral Home in Mason City, with the Rev. Bruce Bolin-Ghitalla officiating. Visitation will be one hour before the service. Burial will be in Mason City Cemetery. Mr. Sparks worked for seven years at the Rocky Ford Limestone Quarry, Lincoln, and for 25 years at Keystone in Bartonville. He was born Sept. 21, 1931, in Princeton to Henry and Bernice Smith Sparks. He married Betty Bagby on July 3, 1955. He is survived by his wife; three daughters, Linda (and Glen) Wilson of Peoria, Cathy Auxier of Mason City and Lisa (and Ralph) Conklin of Mount Pulaski; five grandchildren; two great-grandchildren; one brother, Charles (and Pat) Sparks of Mason City; and one sister, Mildred Willett of Fairfield. He was preceded in death by two sisters. He was a member of the Mason City United Methodist Church. Mr. Sparks enjoyed spending mornings at the coffee shop visiting with friends, and he liked to take drives with his dog, Molly. Memorial contributions may be made to American Legion Jackson Keen Post 496 or to Logan County Animal Control. Maryetta Johnson, 86, of Lincoln died Wednesday (May 5, 2004) at 1:55 p.m. at Maple Ridge Care Centre. Visitation will be from 5 to 7 p.m. Friday at Fricke-Calvert-Schrader Funeral Home in Lincoln. Her funeral will be at 10:30 a.m. Saturday at Zion Lutheran Church in Lincoln, with the Rev. Mark Carnahan officiating. Mrs. Johnson was a homemaker. She was born March 22, 1918, in New Holland to Mark G. and Mary Bock Hubbard. She married Carl William Johnson on Sept. 15, 1935, in Lincoln. He died in January 1978. She is survived by two sons, Richard (and Mary) Johnson of Atlanta and Larry E. Johnson of Lincoln; one daughter, Connie (and Rich) Becker of Bloomington; 12 grandchildren; and 23 great-grandchildren. She was also preceded in death by one son, Paul; two brothers; one sister; and one grandson. She was the last of her immediate family. She was a member of Zion Lutheran Church of Lincoln. Memorials may be made to the church or to Hospice Care of Illinois. Click here to send a note of condolence to the Johnson family. Gerald R. "Sug" Colaw, 84, of Atlanta died Thursday (May 6, 2004) at 12:56 p.m. at BroMenn Regional Medical Center in Normal. Visitation will be from 6 to 7:30 p.m. Sunday at Quiram Funeral Home, Atlanta. Masonic rites will be conducted at 7:30 p.m. His funeral will be at 10 a.m. Monday at the funeral home, with Andy Glass officiating. Burial will be in Atlanta Cemetery. Mr. Colaw owned and operated Colaw Trucking in Atlanta for 50-plus years. Memorial contributions may be made to the Atlanta Fire Department, Atlanta Rescue Squad or American Diabetes Association. Phyllis Ann Goodman, 72, of Lincoln died Wednesday (May 5, 2004) at 6:10 p.m. at her home. Visitation will be from 4 to 7 p.m. Friday at Jefferson Street Christian Church. Her funeral will be at 1:30 p.m. Saturday at the church, with J.K. Jones officiating. 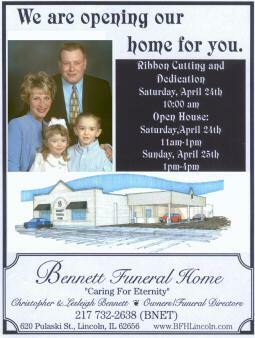 Burial will be in Lucas Chapel Cemetery, rural Lincoln. Fricke-Calvert-Schrader Funeral Home in Lincoln is handling arrangements. Mrs. Goodman and her husband farmed and owned and operated Harold Goodman Excavating in Lincoln. She was born Dec. 18, 1931, at Hartsburg to Lewis and Anna Rosevink Hellman. She married Harold Vernon Goodman on Aug. 20, 1950, in Hartsburg. She is survived by her husband, of Lincoln; three sons, Scott R. (and Debbie) Goodman, Steven R. (and Cynthia) Goodman and Stacy (and Kimberely) Goodman, all of Lincoln; nine grandchildren; and one great-grandchild. She was preceded in death by her parents and was the last of her immediate family. She was a member of Jefferson Street Christian Church and a past member of Zonta Club of Lincoln. Memorials may be made to the church, Hospice Care of Illinois or American Cancer Society. Click here to send a note of condolence to the Goodman family.